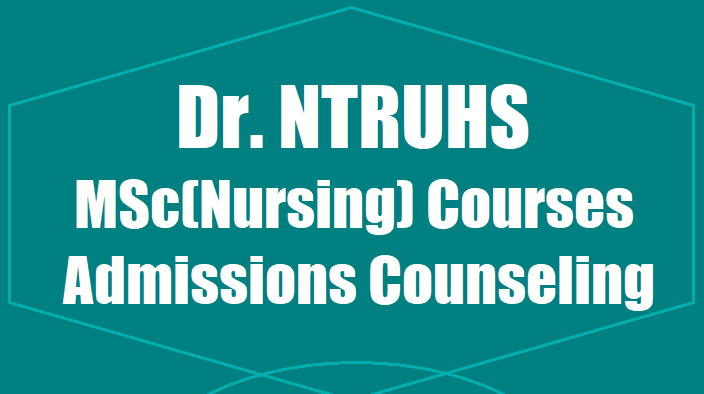 Dr. NTRUHS MSc(Nursing) Courses Admissions Counseling selected candidates list 2017-2018: Dr. NTR University of Health Sciences has given the detailed notification for counseling for Admissions into M.Sc. (Nursing) Courses in Sri Padmavathamma Govt. College of Nursing, Tirupati for the year 2017-2018: 1st and final Counseling for provisional admission into M.Sc. (Nursing) courses in Sri Padmavathamma Govt. College of Nursing, Tirupati will be held on 27-11-2017 from 09.00 AM onwards at Dr. NTR University of Health Sciences, Vijayawada for the academic year 2017-2018. All the eligible candidates who qualified in the Entrance Test held on 24-09-2017 for admissions into M.Sc. (Nursing) courses for the academic year 2017-2018 are only eligible to attend the counseling. The seat matrix for the M.Sc. (Nursing) courses, 2017-18 will be displayed in University notice board and University Website http://ntruhs.ap.nic.in one day before the counseling. The candidates shall pay the following fees on the day of counseling in cash / through crossed Demand Draft drawn in favour of “Registrar, Dr. NTR University of Health Sciences” payable at Vijayawada and shall submit all original certificates noted. Course Counseling Fee payable by all candidates attending counseling Rs. University Fee payable by the selected candidates only Rs. Tuition Fee: All the candidates selected are required to pay the tuition fee as given below as per G.O.Ms.No.153, HM&FW(K2) Dept. dt.12.09.2017 at the selected college and as amended from time to time. Mere attending for the counseling does not confer any right for a seat. 7. Study Certificates from VI to Intermediate in respect of candidates who studies B.Sc. (Nursing) other than Dr. NTR University of Health Sciences. 8. Proof of 10 years residence in respect of Non-Local candidates. 9. Date of Birth Proof (SSC). 10. Any other certificate as per Regulations. For other details refer the Prospectus / Regulations 2017-18 of M.Sc(Nursing) course.